The positive impact of Iowa's gaming industry is more than most imagine. 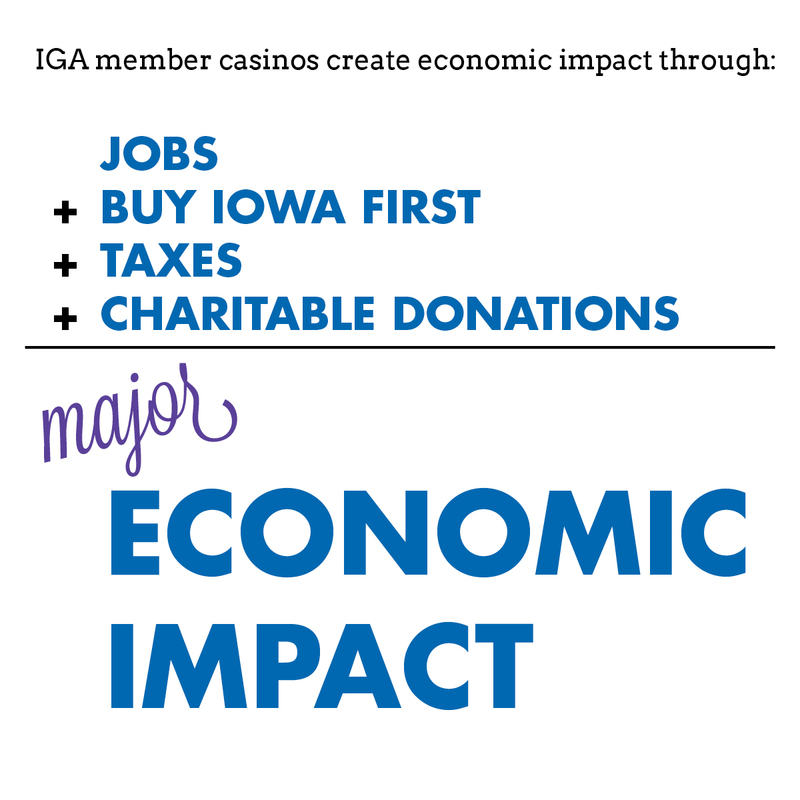 Iowa's casinos create a $1 billion annual economic impact, inclusive of employee salaries, purchases of Iowa-based products and services, charitable contributions and taxes. These monies touch industries that span from infrastructure and tourism, to environmental conservation, cultural attractions and other projects throughout the state. Whether giving Iowa-owned companies the chance to compete for casino business, helping to conserve Iowa's precious natural resources, or embarking on other worthy projects, our state gaming culture is more than slots and cards. It's about giving back, investing in the future and supporting communities. Purchased $239.3 million of products and services from Iowa-based businesses through the Buy Iowa First Program. In fact, nearly 84.5 percent of the total expenditure by casinos on products, supplies and services went to Iowa-based vendors. Paid more than $401.6 million in local, county and state taxes. State tax revenue funds a variety of significant projects, including grants throughout the state and investments in community tourism, state park infrastructure, workforce training and development, prison construction projects, conservation efforts, Vision Iowa and more. Funded 2,175 charitable grants in counties without casinos, totaling more than $8.9 million in community improvements in counties without casinos. Read more in the 2016-2017 "Building Iowa's Communities Through Philanthropy" annual report. Awarded $53 million in 1,377 grants to nonprofit organizations in counties with casinos. Read more in the 2016-2017 "Building Iowa's Communities Through Philanthropy" annual report. Employed nearly 8,900 people, with an annual payroll with benefits of more than $293.6 million. Hosted more than 21.3 million visitors in 2017. See all the stats in the Iowa Racing and Gaming Commission Annual Report. Supported Iowa's agricultural industry by purchasing millions of pounds of beef, chicken and turkey; thousands of gallons of milk; and several million eggs. Each member provides a detailed breakdown of the property's agricultural commodity purchases. Continued their commitment to responsible gaming. IGA members oppose under-age and intoxicated gambling, as well as unregulated and unauthorized forms of gambling. IGA members support having a premier program for gambling treatment, prevention and outreach programs. Each year since 2008, the Iowa Racing & Gaming Commission has released a statement of the economic impact our member casinos have generated. Click the year to see the statement in its entirety.